A few examples of winter sunshine. 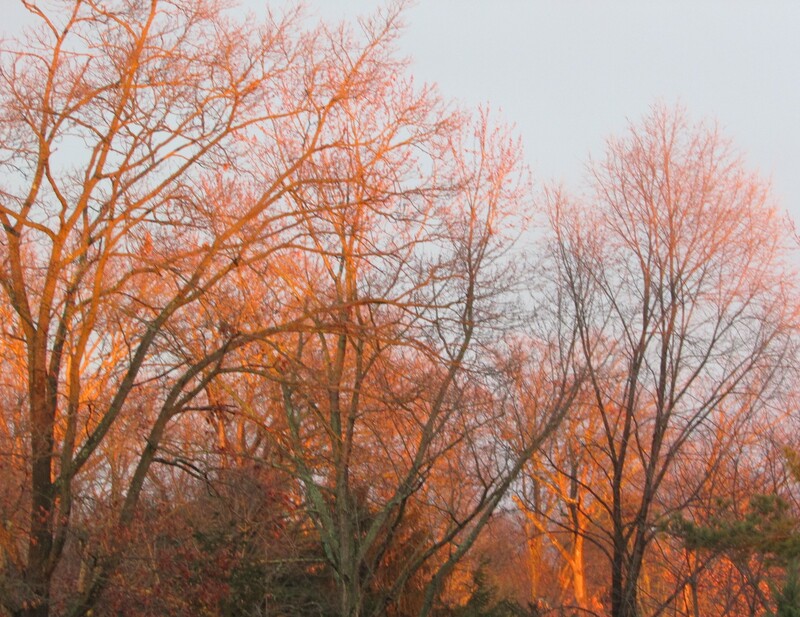 The late-day sunshine of December set these trees ablaze outside my windows. When I lowered the top pane to take a photograph unobstructed by the glass, birdsong filled the air. 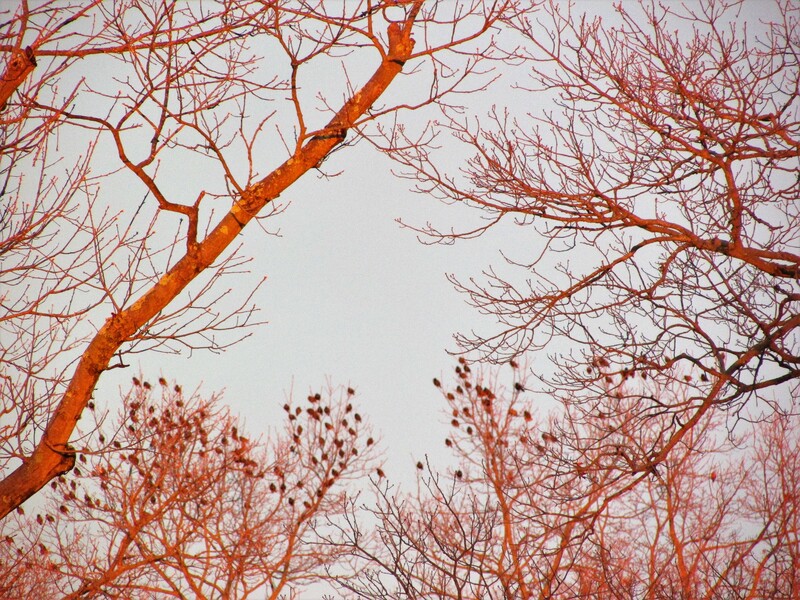 A group of grackles, on barren limbs, were singing an evening-song to put the day to rest. These photos are a part of Dark to Light – Cee’s Fun Foto Challenge. 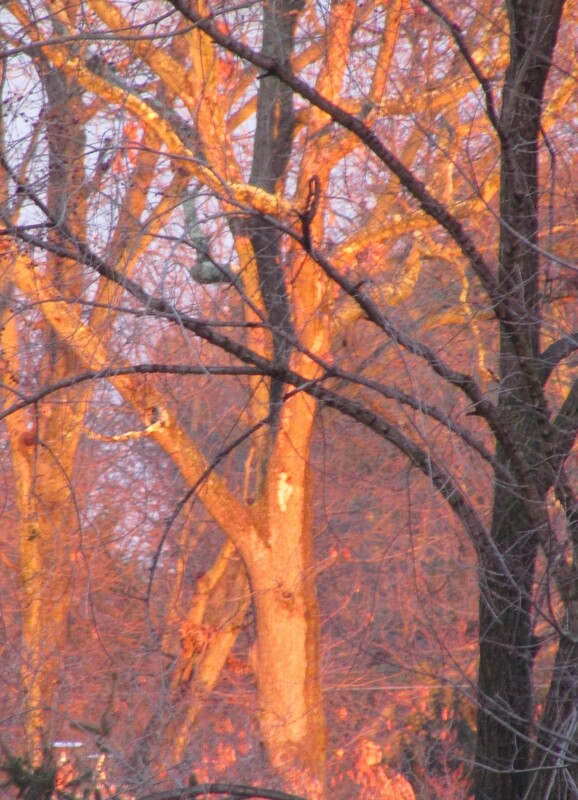 I was struck by the glow as I looked out the window…to hear the birdsong in the midst of it was an added treat. Thanks Cindy! What lovely winter photos! As John and I walked yesterday, we noticed a house ahead seemed to glow. When a neighbor stopped his car to speak to us, we turned. That’s when we saw the sun had hit the clouds behind the mountain, setting them on fire. It was a glorious sight. Thanks so much…it was a lovely moment. and truly magical. I am reminded of the book Heidi in which Heidi describes the sun’s rays hitting the mountain tops in different colors of red, orange, purple and every other color she could think of- she thought the skies were putting up a show for her. I think you have been blessed by having the good fortune to witness this miracle. Hi Susie, did you know Heidi was one of my favorite books as a child, and I have even reread it as an adult. There is also a sequel to it called Heidi’s Children, but that one is a little harder to find. Light like this does seem like a miracle, then to open the window and hear the choir of birds…amazing. I loved that book as a child and read and reread it like hundreds of times, maybe. Wasn’t it a magical, Polly Anna type of book ? I might have read Heidi’s children, I am not sure- did she marry Peter, the goat herd ? Yes, she did, and I think they lived in Dorfli. I love the story. Wonderful post, thanks so much for playing along. Gorgeous winter sunlight. I haven’t done my post yet. I’ll do sunset behind the trees. Still picking between a few photos. Please visit my blog. Thanks so much, I will do just that…have a happy day.